This week I celebrated my birthday by riding what has become an annual “Ride My Age Birthday Ride,” where I ride my age in miles. In order to not feel rushed (because every year this ride takes just a little longer) I took the day off and headed out of the city via the C&O Canal Towpath. The towpath is a popular place to walk, hike, and bike on weekends. I looked forward to hitting it midday, midweek so as to avoid the crowds. Given that my birthday falls in March, I never know what kind of weather to expect. This year, it was sunny and in the 50s. What a great birthday gift, no? It was also breezy (west winds of 18 mph), but like I say, that’s March for you. The windy day was another reason I chose to travel the C&O, as its location and the surrounding trees offer decent shelter in many spots. Even in a pre-spring state, the towpath is beautiful. The occasional runner passed, and even more occasional cyclist. People walked along the C&O with their dogs. I only had to hit the brakes for one dog out of the many that were out so I consider that a successful C&O outing. I paused frequently during my ride to take photos and bask in the sunny day. I had nowhere I had to be, and no need to to hurry. It was one of those days that was just warm enough that, if I chose to linger somewhere, I did not feel an initial chill when I resumed pedaling again. At various times, I had the C&O all to myself, at least in terms of humans. It was me and the geese, the ducks, and the herons. I rode along and thought about the decade I’d left behind. It’s when I started bike commuting, randonneuring, and riding as my primary form of transportation. I also met Felkerino, who fostered my interest in bikes, and has been part of many of my bicycling adventures. I reflected on where my bike has taken me: the Cascades in Washington state; from Rockville, Maryland, to Niagara Falls; France; Colorado; Pennsylvania; my beautiful home state of Iowa; and all the areas in and around Washington, D.C. Sometimes these seem like dreams, or as if they happened to someone else. On yesterday’s ride, though, I vividly recalled them all. Yes, I have seen all these places on my bicycle, I said to myself. I remember. I remember warm sun on my face applying and reapplying sunscreen wearing Gore-Tex in the cold rain, fighting the wind, sailing down a mountain, the fatigue in my legs, and the exhilaration of exploring. I was enveloped in gratitude for all that I’ve experienced on the bike. For a moment, I found myself asking “What if I had started bicycling sooner?” I left the unproductive “What if” conversation alone, and instead chose to reflect on all the good that has been and anticipate the brilliant possibilities of tomorrow. I kept pedaling, savoring my simple life, good health, and the clear beauty of the first day of Spring. Just me and my bike on the Ride My Age Birthday Ride. What’s the Best Advice Anyone Gave You about Cycling? Thanks! That’s a good method too. Going to see how I manage it as the age keeps going up… and, of course, how much time I can take off each year to do it, ha ha! Happy Birthday! Nice to know another March birthday person. I like to lead a ride equal to birthday years, thus having company on the ride — but as Hal above alludes to, lately it’s become more difficult to do in March. Most people are not ready to ride so MANY miles. My birthday is actually this coming Tuesday, and I am leading the usual Tuesday ride for a local club. Haven’t yet disclosed to the group that it’s my birthday. This coming Saturday I’ve pulled together a few friends to ride with me in the beautiful VA countryside, with a stop for lunch at a new cafe in Little Washington. It’s only 55 miles, which they all say will be their longest ride of the year. BUT it doesn’t even come close to my birthday years. I love that you take your birthday off from work – congratulations and many miles to come. Happy Birthday a little early, Joan! I hope you had a great ride this Saturday; we also rode out that way. Cold morning, but a gorgeous day overall! 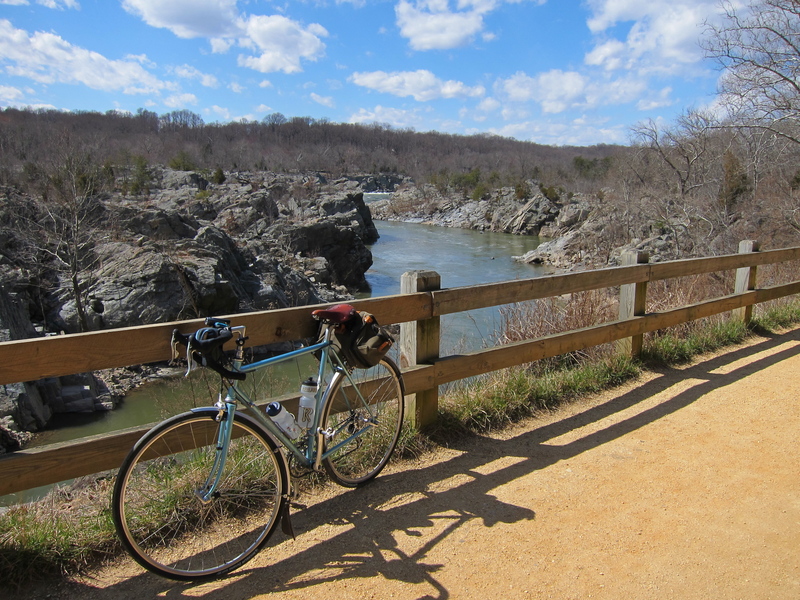 Happy 30th Birthday, MG. As a C&O Park volunteer, I know you were at canal milepost 15, so even I can do the math. The top picture is your Rivendell on top of Mary’s Wall. Nice touch. Many thanks for your blogs; you and Felkerino add a cheerful light to my bike commute. Thank you for the kind words on our blogs! I did not know that segment was called Mary’s Wall. I LOVE that spot, as I suppose many do. I always wish I could represent it in photographs, though, as it is such a gorgeous place on the C&O. Q: How do you know when you are officially old? A: When your birthday ride goes metric. You will be young for a long, long time. What lovely birthday reflections! Glad you got a mild, sunny day. Many Happy Returns! Thanks so much to everyone for the birthday wishes. It got my new year off to a great start! You’re right where you need to be. Congrats on the ride so far!